Location | Luxury Game Lodge, Conference Center and Function Venue. Situated in the heart of the Karoo. game Lodge accommodation at its best. Take the R75 to Graaff-Reinet, bypassing Uitenhage. You will travel in the direction towards Jansenville/Graaff-Reinet. Approx 95 km from Port Elizabeth, you will turn right at the “Sapkamma/Paardepoort” turn-off (33°22’06,00″S 25°02’50,36″E). 5km later, please turn left at the “T” junction (33°20’04,07″S 25°03’06,05″E). Stay on the main gravel road for another 20 km – Koffylaagte Game Lodge will be situated to your left (33°13’54.94″S 24°56’59,08″E). 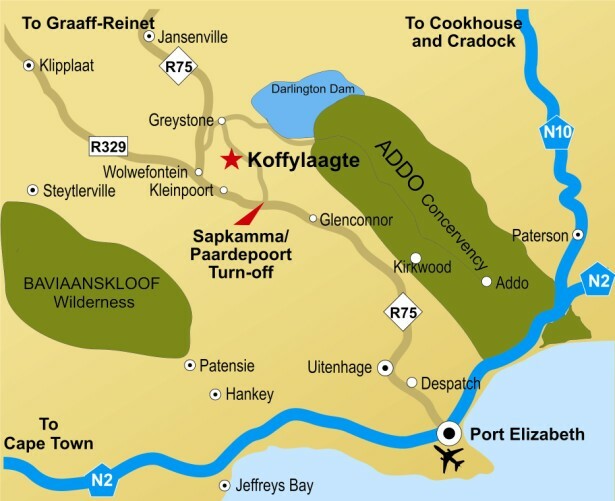 Koffylaagte Game Lodge is about 1hr30min drive from Port Elizabeth. An alternate route for sedan or low carriage vehicles would be to continue on the R75 for approximately another 32 km – you will travel past the turn-off to Blaauwbosch and Wolwefontein – you will see the turn-off for Greystone (33°12’08,22″S 24°50’39,32″E). Turn right and travel for approx 9km on a gravel road. You will get to a T Junction marked Darlington / Paardepoort (33°09’31,68″S 24°54’01,49″E). Turn right towards Paardepoort and travel for a further 9km. Koffylaagte Game Lodge will be situated on your right (33°13’54,94″S 24°56’59,08″E).